Key bibliometric numbers: H-index: 49 (Scopus, March 2017); Total number of citations: 11,316; Among the Top 50 Cited Parkinson’s disease Investigators worldwide from 2001-10 and Top 50 PD investigators worldwide with a most broad-impact citations (Sorensen & Weedon, 2011). Miquel Vila received his medical degree from the University of Barcelona Medical School (Barcelona, Spain) in 1993. He then moved to the laboratory of Experimental Neurology and Therapeutics, INSERM U289 (Prof. Y. Agid) at the Salpêtrière Hospital in Paris (France), where he obtained his Master degree (DEA) and PhD in Neuroscience from the University of Paris VI (Pierre et Marie Curie), under the supervision of Dr. E.C. Hirsch. His PhD work was devoted to the study of the functional consequences of dopaminergic neurodegeneration on the functioning of the basal ganglia. From 1998 to 2001, he worked as a postdoctoral researcher at the laboratory of Dr. S. Przedborski at the Department of Neurology, Movement Disorders Division, at Columbia University (New York, USA), focusing on the molecular mechanisms of neuronal death in Parkinson’s disease. To continue his work, he obtained in 2001 a tenure-track position as an Assistant Professor of Neurology at Columbia University, the permanent residency of the USA (“outstanding researcher” category) and a 5-year $1M R01 research grant from the National Institutes of Health (NIH, USA). 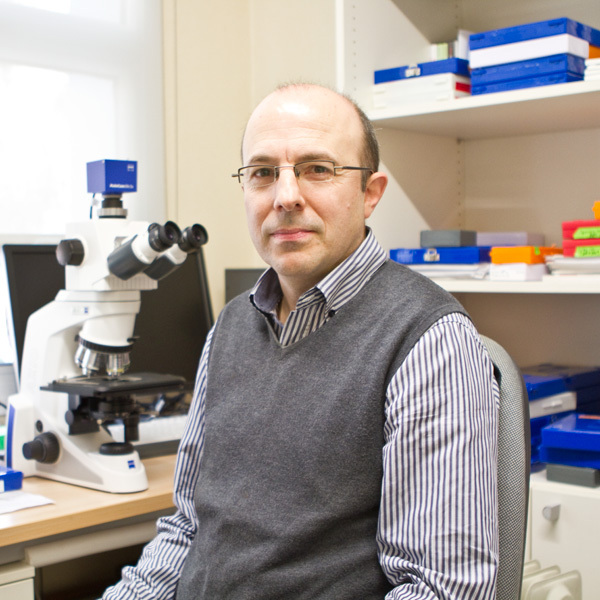 In 2006, he moved back to Barcelona as a Professor at ICREA (Catalan Institution for Research and Advances Studies) to develop a new research lab on neurodegeneration at the Vall d’Hebron Research Institute, thanks to the support of a 1.2M€ European Commission’s Marie Curie Excellence Grant. In addition, he holds positions as Associate Professor at the Department of Biochemistry and Molecular Biology of the Autonomous University of Barcelona (UAB) and as Principal Investigator of the Center for Networked Biomedical Research on Neurodegenerative Diseases (CIBERNED).